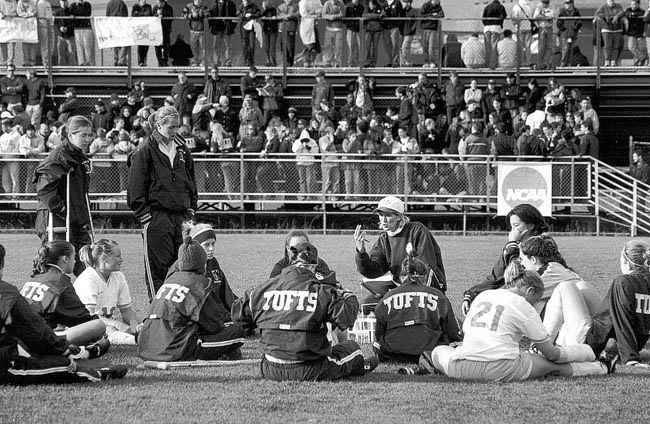 MEDFORD  Second-year head coach Martha Whiting, J'93, wasn't prepared for the success the Tufts women's soccer team had this past season. The NCAA National Runner-up trophy they earned was on the couch in her office. Her New England Coach of the Year plaque was on the floor. After she went to Indianapolis to pick up the National Coach of the Year Award, she quickly had to arrange for some shelves to be put up. The new pieces of hardware that now adorn her office are the rewards of a spectacular 18-4 season. The underdog Jumbos won the NCAA New England Championship for the second time in three years. After winning their way into the national semi-finals, Tufts was selected to host the "final four." With a thousand fans cheering them on at Kraft Field on both weekend days, the Jumbos advanced to the National Championship game. They lost to College of New Jersey, 2-1, on a goal with three seconds left in the game. Despite this heart-breaking ending, the team made a great impact on the national soccer scene and on the campus. Whiting, who is humble to the core, intends to enjoy the team's increase in popularity. "All of it came so fast," she said. "I've been coaching for a while, but I've only been head coach for two years. I'm just going to enjoy it, because who knows if we'll ever do it again? We have until August to enjoy it, and then we'll see what happens next year." Whiting accepted the National Soccer Coaches Association of America Division III Women's National Coach of the Year award during the national convention on January 19. Tri-captain Sara Yeatman, the first Tufts player to be named a First Team All-American, thinks the award is a sign of great things to come for the team. "Considering Martha's young and comparatively new to coaching, I think it's amazing that the other coaches in the country recognized what a great coach Martha is and what a key role she played in our success," Yeatman said. "I think Martha deserves the honor and that it is a great way to show her how important she was to us. I feel that while to some coaches it would be a good cumulative way to round out a career, for Martha it will only drive her to work harder and do more." Born and raised in Wakefield, Mass., Whiting was a three-year starting goalkeeper at Tufts. She owns the team records for saves in a career with 385 and shares the mark for fewest goals allowed in a season (6 in 1990). After graduating, she was an assistant coach at Tufts under Bill Gehling for six seasons. When Gehling was promoted to Athletic Director at Tufts in July 1999, Whiting was named head coach. "Being a head coach at Tufts is something I've always wanted," she said at the time of her promotion. "I played here and I wanted to stay here." Despite her sudden success, Whiting isn't just sitting back and gloating about her team's achievements (well, not too much). This winter she's an assistant coach on the women's basketball team, which had an 11-7 record and was competing for a spot in the NESCAC playoffs in early February. She's made her mark on that team, as well. "After a long fall season, a coach going right into a long winter season might just go through the motions," women's basketball coach Janice Savitz said. "That's not Martha. She's great. She gets involved and relates to the team well. She's one of our best defensive players in practice, too." Come summer, Whiting will begin to concern herself with the loss of team captains Randee McArdle, Carmen Mikacenic and Yeatman. Now that the Jumbos are nationally recognized, there's a certain amount of pressure that comes with staying on top. That's for later, though. For now, she's just enjoying her life as a coach at Tufts.